Lake Balaton is the largest freshwater lake in Central Europe and the most popular vacation region in Hungary. Lining both shores of its 48-mile (77km) stretch are many towns and resorts, and the north and south shores are distinctly different in character, offering something for everyone. The south shore is thronged by a string of largely uniform holiday resorts and high-rise buildings where crowds of young people congregate for hedonistic holidays. Besides the pretty beaches and good swimming options, there are numerous land and water-based activities while at night the discos pulse until the early hours. Siófok is the largest and busiest resort and it dominates the southern shore during the summer months, but it is almost completely dead in winter. By contrast, the northern shore has limited waterfront development due to its deeper, colder waters and reed beds. Its attractions are more historical and cultural in nature. Although there are resorts here, it is generally a destination embraced by travellers looking for picturesque scenery, interesting towns, and mineral spas, complemented by the fine wines from the nearby hills of Badacsony, rather than a party scene. Many of the villages on the shores of the lake are home to a number of medieval ruins and fortresses to explore. Lake Balaton has been a popular recreation area since the Roman times when the aristocracy built villas and set up health spas here. It was also a famous winegrowing region and the graceful rolling hills, cool water, and warm sunshine still provide the perfect setting and climate for both vacations and vineyards. 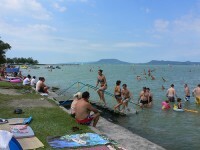 We are looking for contributors for our Lake Balaton travel guide. If you are a local, a regular traveller to Lake Balaton or a travel professional with time to contribute and answer occasional forum questions, please contact us.